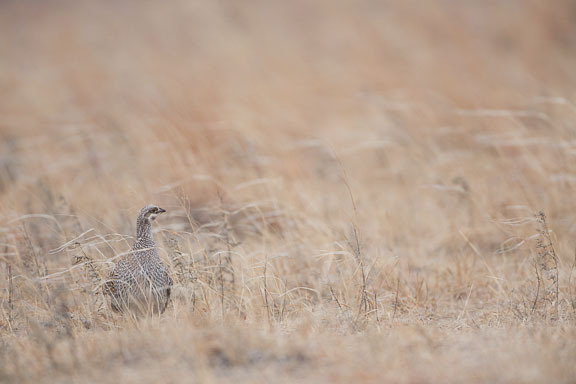 I recently headed to Nebraska with a good friend and awesome photographer to witness the annual lekking courtship of the Greater Prairie Chicken and the Sharp-tailed Grouse. We had to be good friends and very tolerant of each other as we spent ten mornings in small blinds in close proximity. We did very well, I must say! I have photographed our local Greater Sage Grouse on it’s lek on numerous occasions but wanted to see these two other birds displaying in the sandhills of Nebraska. It was quite a sight and as always: I want more!! 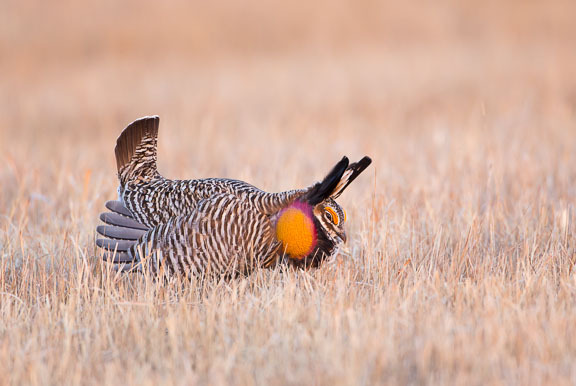 The Greater Prairie Chicken male displays a pair of pinnae (ear like feathers) along with an orange and purple air sac as it produces a soft, low, hooting sound. They also do a short hop-flight with a cackle that sounds as though you may have just entered a jungle. They will battle each other for top spot in the lek. The bird that holds the top spot has most of the breeding honors. They will display to each other casually, but the real “ruckus” happens when a female enters the courtship arena. Suddenly, all of the males are hooting and dancing, sparring with each other as necessary, truly strutting their stuff. The hen wanders through the lek with an indifference to all of them, taking in the attention and checking out the merchandise. A spectacular audible and visual sight! 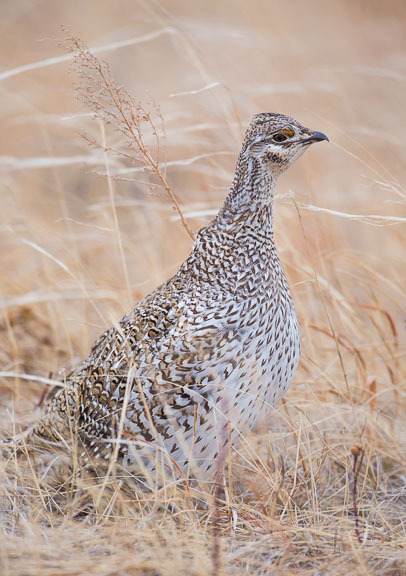 The Sharp-tailed Grouse is less colorful but no less spectacular. These males entertain their hens on the tops of the sand hills. They have a smaller air sac but it is colored a bright purple. They display with wings spread, air sac puffed, and yellow eyebrows raised. Stomping their feet, they will all go into a display position and synchronize their moves with the top male initiating the start. Crazy sounds are made by all consisting of hoots and snapping of tail feathers; as usual a flurry of activity comes into play with the presence of a female. 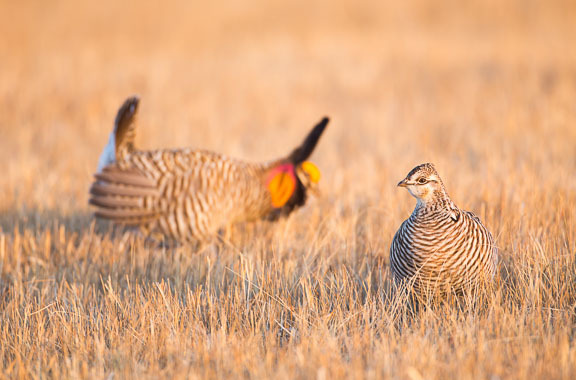 These two birds are truly something to see on their spring courting arenas. Like a number of our other native birds, their demise will be the loss of habitat. 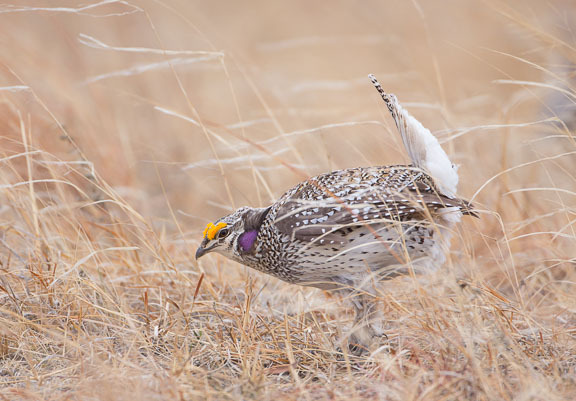 Historically, the grasslands they need have been under siege for a long time, shrinking the available habitat and thus decreasing their numbers. 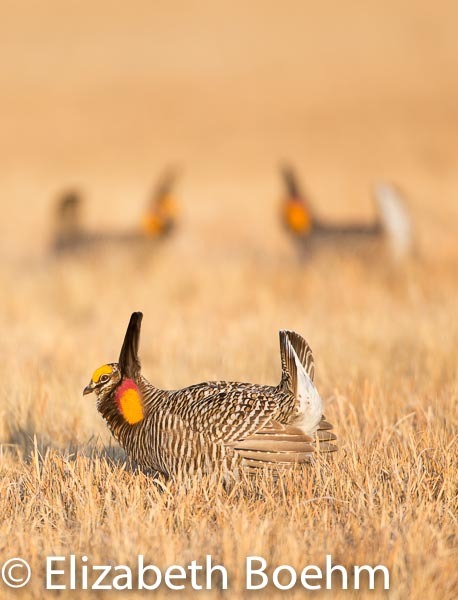 Conservation programs are coming into place and efforts are being made to preserve or restore the native prairies. May enough Americans find these birds worthy of saving!